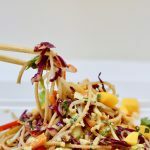 This Cold Thai Noodle Salad with Green Curry Dressing is bursting with Umami flavours! It’s so good you’ll be licking your plate, and it’s Vegan and Gluten Free. Add dressing to bowl stir and enjoy! If using nuts and mango for garnish add at end or use as garnish on individual plates. For veggies: to save time buy coleslaw mix, but it doesn’t taste as good in my opinion, but good in a pinch! Ginger: I peel my ginger and keep it in the freezer and grate it frozen. It’s awesome!